Available as a PDF or the format of your favorite e-reader. Or get the print version of the book for $17.99 on Amazon. As a bonus, get a free copy of the Kindle version when you buy the print edition. Interested in bulk order or group pricing? Click here. Volleyball Coaching Wizards is an excellent compendium of eight diverse coaches with different philosophies, from different cultures and different levels that have one common theme – championship teams. This book’s unique format of ‘coaches interviewing coaches’ provides both depth & valuable insights into the many facets of their success. They are from five different home nations, with experience coaching in numerous others. They’ve worked with both female and male athletes. Some have been mainly full-time coaches while others have coached around full-time day jobs. We have both indoor and sand covered as well. Basically, they represent the driving concept of the Volleyball Coaching Wizards idea. What is Volleyball Coaching Wizards? Instead, Volleyball Coaching Wizards is about the thinking that surrounds the technical and tactical side of things. It’s about letting you see what great volleyball coaches have in common, and where they differ despite all having great success over their career. There are two main goals of the Wizards project. One is to provide both information and inspiration to volleyball coaches everywhere. The other is to help develop a real volleyball coaching literature, one which matches what can be found in other sports. Listen to what Stelio DeRocco has to say about the Wizards project. Stelio is a former Australian and Canadian national team coach. 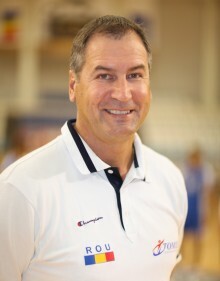 He is also a well respected professional volleyball coach of teams in Italy and Romania, and most recently Poland. Who is behind Volleyball Coaching Wizards? As is true of the Wizards, the two individuals behind the project have a wide volleyball coaching experience. John Forman is the author of the Coaching Volleyball blog. His experience as a coach includes Juniors and high school, college and university in the US and U.K. He also coached professionally in Sweden. Further, he founded and ran the largest juniors club in his native Rhode Island. John is the author of multiple books and dozens of articles. He also published the book Inside College Volleyball, which is about US college recruiting. John earned a PhD from the University of Exeter. He holds a CAP III certification from USA Volleyball and is a Level 3 coach for Volleyball England. He is also a member of the American Volleyball Coaches Association (AVCA). Mark Lebedew authors the At Home on the Court Blog. He coaches professionally in Poland. That follows five season Germany where his teams won three straight league titles and a CEV Champions League bronze medal. He has prior professional experience in Belgium and Italy. Mark is also Head Coach for the Australian Men’s National Team. He previously assisted internationally for both Australia and Germany.